In January 2013, I wrote about the restaurant on the southeast corner of Jericho Turnpike and Round Swamp Road. You can find the original article by selecting January 2013 in the box to the right. Now thanks to the wonders of the Internet, we may know who transformed the architecture of the building to match the cuisine served inside in the 1950s. Prior to 1955, the restaurant was a Spanish inn that served southern fried chicken, sirloin steaks and sugar cured ham steaks. In February 1955, Peter Chinn changed the menu to Chinese fare and renamed it King Wah. Chinn also arranged to have the building converted into a Chinese pagoda. This is where the Internet helps to complete the story. Local history is by definition of local interest. But people are not strictly local. They move around and work in various places. A researcher trying to find out more about a Chinese American architect who never lived here and who did extensive work in Shanghai and New York City’s Chinatown would have no reason to look to Huntington for information. But she found in the architect’s scrapbook a picture of a Chinese restaurant named King Wah with no other identifying information as to its owner or location. Naturally she entered the name in a search engine and that led her to a blog post about a closed restaurant in Huntington. The unidentified photograph in Poy Gum Lee’s scrapbook. Courtesy of the Lee family archive and Elizabeth Chan and Kent Jue. The researcher, Kerri Culhane, contacted me for more information. Unfortunately, the Town Building Department records have no information on a building permit issued 60 years ago. Nor did the archives of The Long-Islander newspaper offer any clues. The architect, Poy Gum Lee, lived in Mineola for a time in the 1950s. And although the restaurant owner, Peter Chinn lived in Greenlawn, Long Island’s Chinese population in the 1950s was quite small. It would not be surprising that Mr. Chinn would have retained Mr. Lee is design the conversion of his restaurant. 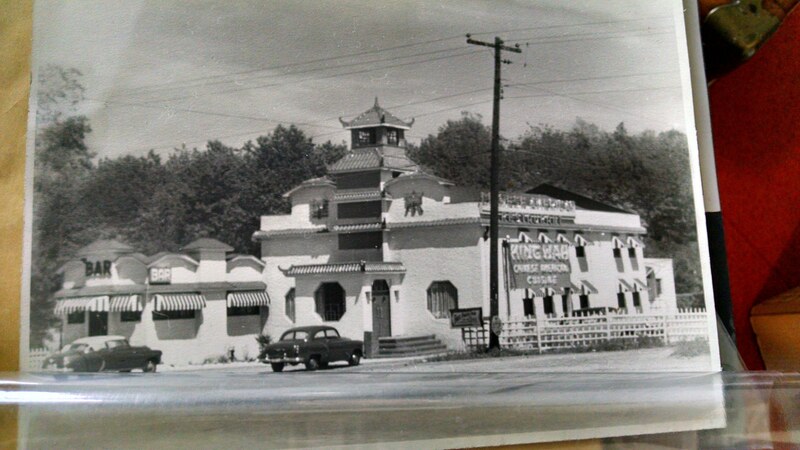 Why else would the architect have a picture of King Wah restaurant in his scrapbook, unless he designed it? So who was Poy Gum Lee? Here is a brief summary from Ms. Culhane, who will curate an exhibition about Poy Gum Lee at the Museum of Chinese in America in Fall 2015. Born in New York’s Chinatown in 1900, Lee studied architecture at the Pratt Institute, MIT, and Columbia University before embarking on professional career in China in 1923. Lee was responsible for executing the designs of the Sun Yat-Sen Mausoleum in Nanjing; and the Sun Yat-Sen Memorial Hall in Canton (Guangzhou), two major commissions of international importance. His extensive work in China ranged from luxury apartment complexes to civic and cultural commissions, to movie theatres, churches, hospitals, schools and private residences. As a member of the first generation of professional American-trained Chinese architects practicing in China in the 1920s and 30s, Lee became a central figure in the development of the Chinese modern movement in China, and a founding member of the Society of Chinese Architects. Upon his post-war repatriation to the US in 1945, Lee embarked on a new phase of his career that brought modernist ideas from China to Chinatown. As the first known Chinese-American architect practicing in Chinatown in the mid twentieth century, Lee influenced the changing architectural aesthetic in Chinatown during that period. Lee’s hand is visible in the major civic architecture of Chinatown post 1945, which blends stylistically Chinese details with modern technologies and materials. Lee was the architectural consultant for the Chinese Consolidated Benevolent Association’s building on Mott Street (1959); and the On Leong Tong Merchant’s Association at Mott & Canal Street (1948-50), the most prominent Chinese modern building in Chinatown. Among his highly visible commissions, Lee designed the Chinese-American WWII Monument in Kimlau Square (1962), a modernist take on a traditional Chinese pailou, or ceremonial gate; the Lee Family Association (ca. 1950); and the Pagoda Theatre (1963, demolished). In Fall 2015, Lee will be the subject of an exhibition at the Museum of Chinese in America in Manhattan, which will examine the life & career of Chinese-American architect Poy Gum Lee through the lens of century of architecture in Chinatown. Architectural historian Kerri Culhane will document and explore Lee’s nearly 50-year long career in both China & New York, and examine Lee’s modernist influence in Chinatown. I really enjoyed that article! A big part of my childhood was spent in King Wah, and always happy memories! Thank you. Thank you for sharing this. This restaurant was a favorite of my Grandmother’s in the 60’s. I have often wondered about the origin.